Technicians: Here’s your chance to win a free customized Tech N9ne All 6’s and 7’s Macbook! 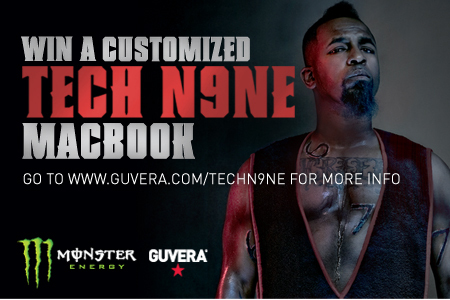 In partnership with Strange Music and Monster Energy, Guvera will award this special Tech N9ne Macbook to whoever can refer the most people to https://www.guvera.com/techn9ne. You can download Tech N9ne’s ENTIRE catalog for free, including his new groundbreaking album All 6’s and 7’s. It’s entirely legal and Tech N9ne along with all the other artists available on Guvera.com still get paid! The contest is live now, so start spreading the word about https://www.guvera.com/techn9ne and win your customized Tech N9ne Macbook! Contest ends July 22. Want to know what the Macbook will look like? It’s a secret! Only the winner will know, so that means you need to start spreading the word about Guvera.com today.